The Historical Centre of the City of Yaroslavl is a product of Catherine the Great's town planning reform and is dotted with 17th century churches. Yaroslavl (250 km northeast of Moscow is said to have been founded in 1010. It lies at the intersection of major highways, railroads and waterways. In the 17th century, Yaroslavl was Russia's second largest city and, for a time (during the Polish occupation of Moscow in 1612), the country's de facto capital. Its main churches date back to the same period. 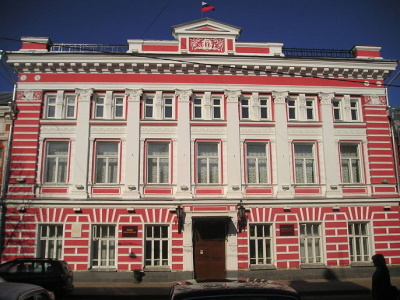 They belong to the so called Yaroslavl type: built of red brick, with bright tiled exteriors. Those of St. Nicholas Nadein and Elijah the Prophet have some of the Golden ring's most impressive frescoes. Yaroslavl was also rewarded world heritage status because it is an outstanding example of the town-planning reform ordered by Empress Catherine The Great in the whole of Russia, implemented between 1763 and 1830. The city also holds a number of significant neo-classical buildings. Yaroslavl is the biggest city of Golden Ring, easily reachable from Moscow. I came there after reading other, not very enthusiastic, reviews on this site and again it seems that during last couple of years Russia changed a lot. This time I did not focus on ticking inscribed churches, but instead took a couple of hours to walk in the beautiful streets of Yaroslav's Old Town. Although some works are still going on, almost all city center is already rebuilt/renovated and the result is very impressive. For me Yaroslavl is a wonderful city, comparable to top classicism-style towns in Western Europe – in my personal ranking even better than, say, Bordeaux. It was only a bit awkward that this beautiful old town in warm summer evening was almost empty. While I was looking my aunt’s Facebook post of her recent tour to Russia, I was intrigued with the images of Yaroslavl, and that brought back memory of my 2007 trip to this city. Initially Yaroslavl was not part of a plan; all suddenly happened when my friends and I had lunch in St. Petersburg and one of them wanted to see Volga River because he believed that it was a divide line of Europe and Asia. Maybe because of too much Vodka in our blood, on that day night we were on the train to Yaroslavl via Moscow! The train was very slow and very cold with no heater and full with drunken Russian and Dutch passengers, when we heard the word “Yaroslavl” we happily jumped out of the train, after some direction confusing, we discovered that we turned up at a wrong railway station outside Yaroslavl! No bus and no taxi and almost dark, we decided to walk to Yaroslavl for about 5 Kilometers, on the way we unknowingly walked past the famous St John the Baptist Church which is featured in 1000 Ruble banknote, we stopped to see the church because of its irresistibly amazing and graceful domes. When we reached the city, it was dark and covered with thin layer of snow. We successfully made our way to hotel without lost. We were so tried and slept like a log until next day late morning. When we walked around, we felt sad to the city with its decaying state, tram was very old and the tracks were not properly maintained. Everything seemed a little bit better when we reached the old city area. We saw the newly renovated fortified church of Spaso-Preobrazhensky Monastery; the repaint did everything in the complex looked unbelievably new and we were disappointed. Then we continued to see the Volga River, the riverside park was shabby and the Volga was just another river with nothing special. Since we fulfilled our goal to see Volga quite early, we did not know what we should do next so we just walked around the city. One thing we noticed was that Yaroslavl was full with churches and these churches were very nice especially Church of Elijah the prophet with its amazing painting and iconic green domes and two belfries, the small but lovely Alexander Nevsky Chapel in the middle of large square was striking for its nice design, Church of Epiphany was another highlight with its red grazed brick and tiles, and the neo-classical Ilyinsko-Tikhonovka Church was very unique with its Roman dome and columns. We spent around four hours around the city center and decided that we should better back to Moscow, so we took the evening train back but ending at Rostov Veliky instead but that’s another part of memory. I have to admit that I was quite disappointed with Yaroslavl, the city was not in good shape while I was there; but when I saw my aunt’s photographs, I was really surprised how the city has change during the past seven years. The city now is vibrant and attractive; they rebuilt Dormition Cathedral in the Volga riverside park which creates a nice landscape view from Church of Elijah Square, even the Ilyinsko-Tikhonovka Church has been renovated and has golden spire. The streets look clean and the city modernized the tram system. My aunt even said that Yaroslavl is her favorite city in the Golden Ring. The question of revisiting is in my mind as many of my friends also want to complete the Golden Ring. But thinking again that the decay post-soviet image of Yaroslavl is the unique reason why I still can remember the city vividly, so should I treasure this old memory by avoiding the new one is still the thing I cannot find the answer. Yaroslavl is a well preserved neo-classical city planning on the urban street and displays unique churches combined with traditional russian orthodox ecclesiastical architecture,especially for the porches which derives from Greek temples. The Radial urban streets are linked with three main squares in which the church,theater,fire station and something each there. 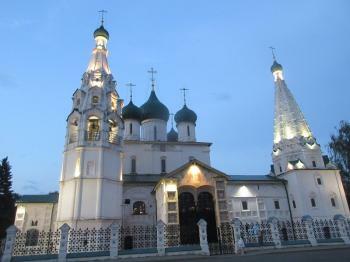 Yaroslavl isn't enough for day-trip from Moscow,but worth for visiting. The historic centre of Yaroslavl was inscribed in 2005 perhaps as part of a “tourist push” in advance of the town’s thousandth anniversary in 2010 and we quite enjoyed our morning there in May 2007. The main justification for inscription was its late 18th century urban master plan in neo-classical style, the construction of which lasted into the 1830s, and its numerous churches, mainly from the 17th century (but going back to the 16th century monastery) often built in red brick with coloured tiles (photo). Its situation on the Volga/Kotorosl confluence is very pleasant. The streets and parks are leafy and it has a quiet civilised atmosphere belying its 600000 population. The Soviet period didn’t result in a great deal of building in the town centre which remains on a “human scale” and the whole area is easily “walkable”. But the Soviet period was far from totally benign. The city was lucky that, of its 80 churches, 56 have survived, albeit in various stages of preservation after periods of use as warehouses, sports halls etc. One of the gems, with very fine murals in (to our eye) a reasonable state of preservation, is the Church of Elijah the Prophet. This is situated on “Soviet Square” and somehow escaped being blown up in the 30’s when the local Komsomol branch complained that it obstructed political meetings! Another church wasn’t so lucky. 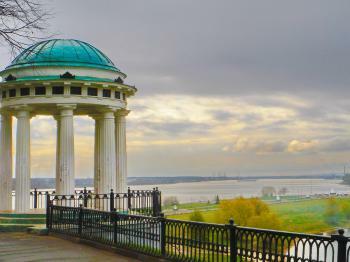 The site of the Dormition Cathedral is today a park overlooking the Volga. This provides an insight into post-Soviet Russia in that a local businessman is proposing to build a new cathedral on the same site in time for 2010. We discovered his name (V Tyryshkin) but were told that nobody knew how he obtained his money. In fact the Web shows him to be.... (surprise, surprise!) a “construction magnate” (I wonder whose company will “win” the building contract!!). We were also told that no one knew how much it would cost – again the Web states 20 million Euros (which doesn't seem enough for an entire Cathedral??). A “competition” has been held to decide the design but the locals’ favourite, a near reproduction of the original, is not favoured by the government or church. UNESCO watches from the sidelines but, after accepting an incongruous mosque in Kazan, can hardly complain about a new church? Generally we felt it would have been more appropriate (albeit less grandiose) if Mr Tyryshkyn were to use his money for restoration rather than rebuilding – but it does appear that he is continuing a tradition of “merchant churches” which had given Yaroslavl many of its 17th century churches in the first place! Pleasant it may be, but Yaroslavl isn’t a “great” WHS and I personally found nearby Kostroma more interesting (not even on Russia’s T list) for its own Catherine the Great period town design (and more complete Trading Arcades than Yarosalvl) and its Ipaty Monastery (superb frescoes). In Yaroslavl the cathedral within the monastery is closed for restoration and the visit there was a bit dull – especially if you didn’t want to support the showing of a lonely brown bear in a rather small enclosure. The main objective of the site seemed to be to provide a location for the selling of matryoshka dolls and other tourist goodies. To us Yaroslavl’s main interest lay more in providing clues to provincial life in post-Soviet Russia than in its historical remains. Brick architecture: Yaroslavl's many churches in the WHS area are brick architecture; for example, Chuch of Epiphany and Church of Alexander Nevsky. 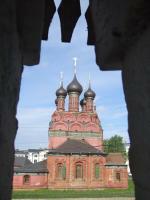 Fortified religious buildings: The Spaso-Preobrazhensky Monastery in Yaroslavl was built to be a citadel in times of war. The monastery is surrounded by a thick 16th century, white-painted wall, complete with watchtowers and embattlements. 74 Community Members have visited.